Lake Anne Plaza’s bricks will be turned into a fresco gallery June 7-8 as it hosts its first Chalk on The Water festival. Chalk on the Water is a two-day street-painting festival where participants can create street art. Lake Anne has partnered with Murals of Baltimore for the event. Lake Anne is teaming with Initiative for Public Art-Reston (IPAR) to bring this public art event to the plaza. Funds raised from the festival will be donated to IPAR. Festival-goers can purchase a plot of brick space on the plaza and paint to their hearts delight whatever flows from their imagination. Cost for spaces are $5 for children, $10 for adults, and $15 for professional artist. 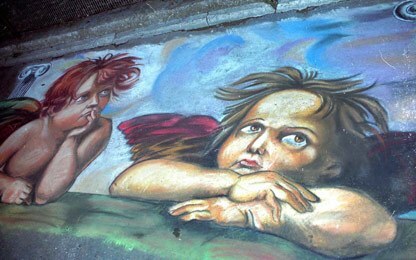 Want to learn ahead of time how to draw chalk art masterpieces? Lake Anne will host a free workshop on Saturday, May 31 from 10 a.m. to 12 p.m. on the plaza. The festival will also include food, entertainment, local vendors, an array of children’s activities. To close out the family fun weekend, Up, the second movie in the free Lake Anne Summer Film Festival, will be shown Sunday, June 8 at sundown. Prior to the movie, viewers can get a preview of IPAR’s 15-minute short film titled Fun, Beauty, Fantasy: Reston’s Public Art (2012).